Sorry, I know this question has been asked before, but I haven't seen an answer which applies to my specific situation. I have a super budget built Surly Karate Monkey. It's got a used Avid BB7 disc brake set on it. The rear caliper looks like it might be some cheap thing which was taken off of a Walmart bike or something. It's very warped, and I can't get it adjusted right. Somebody on my local CL has a used 140mm caliper that can be had for only 10 dollars. The current size on the rear of my bike is 160mm. Can I buy this used 140mm caliper and make it work? 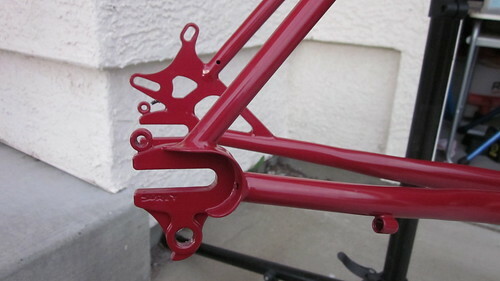 If your frame is a IS mount instead of a post mount you can get an adapter to either size. I have used both on the rear of my mtb(currently has 140 on the rear 160 front). The 140 rotor is a little harder to lock up, which can be a good thing depending on what you are out for. The adapter is not expensive, so if you get the rotor/caliper combination fitted and find it does not meet just check your shop and they can order it for you. This is what my rear mount looks like. I'm assuming this is an IS mount right? Looks pretty adjustable to me. The rear caliper looks like it might be some cheap thing which was taken off of a Walmart bike or something. It's very warped, and I can't get it adjusted right. Somebody on my local CL has a used 140mm caliper that can be had for only 10 dollars. The current size on the rear of my bike is 160mm. Can I buy this used 140mm caliper and make it work? Don't you mean a warped rotor. Does the caliper have IS mounts or post mounts ?